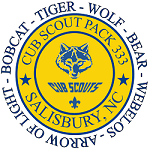 Listed below are the ranks in the Cub Scout Program. Click on the appropriate one for you to learn more. All den activities are planned so boys can complete badge requirements as soon as possible. However...Parents please note that some requirements must be done at home. and let the Den Leader see it to record your son's progress.